There is no doubt that Moscow understands that Syria will no longer be the way it once was, neither in terms of government nor borders. If returning to a pre-war situation is not an option, consultations should take place to determine how the country will be governed in the future. The first substantive meeting between the Russian and US presidents turned out to be as successful as it possibly could. The two countries have extremely strained relations, and their stances on the most critical issues range from strongly divergent to diametrically opposite. Mutual trust is at an all-time low since the Cold War, and maybe even longer. With all this in mind, what we heard after the ninety-minute talks should be regarded as a sign of progress. Syria was the only issue on the agenda, or nearly so, that reflects the current state of Russian-US bilateral relations, in which raising a broader range of issues does not make much sense. Overall, the differences are so important that trying to narrow the gap seems like a waste of time. But when a specific issue emerges that is important for both parties, and when the perspectives coincide, be it slightly (as with ISIS, in this case), a business-like discussion is possible. This has nothing to do with cooperation in fighting a common enemy. The fact that both leaders are speaking about a coalition to combat the Islamic State points to different, not coinciding, approaches, since the two have their own vision of the coalition that should be created. For the US, the possible coalition would be a group of countries that share the American strategy and agree to follow along the lines the US traces. However, this line is not clear. The main reproach Obama constantly hears is that his Middle East policy is inconsistent, that it is unclear whether it is pursuing a specific objective, and to what extent the White House is committed to achieving it. When comparing the coalition he would like to see with the anti-Hitler coalition, Vladimir Putin implied that Moscow is ready to lay aside all other divergences for the time it takes to combat ISIS and expects others to do the same. The information center established by Russia, Iran, Iraq and Syria is likely to serve as a blueprint for further efforts. The Russian president invited everyone to join it. Bashar al-Assad’s fate was and still is the main stumbling block. 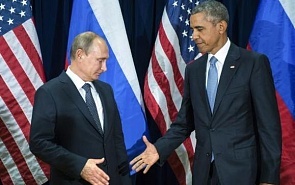 Putin has publicly called for relying on Damascus as a foundation for combatting ISIS, while Obama called the Syrian leader a dictator and once again said that the US expects him to leave power. For many US observers, Obama’s bold statements are not so much an expression of his inflexible will as they are an attempt to masque his qualms on this issue. To fight in Syria against ISIS and the al-Assad regime at the same time, which is now the official approach of the US, would mean bringing about increasingly unmanageable and unpredictable contradictions. Renouncing the demand for the Syrian leader to resign seems impossible, since it puts into question the Syrian policy over the last four and a half years. However frightening the prospect of leaving Syria in total ruin may be, this is the most likely outcome of the contradictory approaches advocated by Russia and the US. This could spell the onset of a different, more catastrophe-prone environment in the Middle East. In any event, by taking Damascus, Abu Bakr al-Baghdadi would take his bid to create a caliphate one step closer to reality. There is no doubt that Moscow understands that Syria will no longer be the way it once was, neither in terms of government nor borders. If returning to a pre-war situation is not an option, consultations should take place to determine how the country will be governed in the future. But what comes first? Russia believes that the first thing should be to understand when the advance of the Islamists will stop, if ever, and demarcating the remaining territory. Only after that can discussions on how to run this zone begin. Russia has a negative opinion of the Western-backed opposition. In his statement at the General Assembly, Putin said that only the Syrian government forces and the Kurdish militia are fighting ISIS. The West insists on the need for diplomatic efforts to establish a coalition government in Syria, even if this means working with the proponents of the current regime, which is a substantial shift, but without al-Assad. Meanwhile, some are becoming increasingly vocal about the fact that al-Assad’s withdrawal should be a result, not a prerequisite of the negotiating process. All disputes that are regularly brought into the public eye could continue alongside military and technical initiatives in the conflict zone. The main outcome of the meeting between Putin and Obama, which was confirmed by both parties, is that the military of the two countries will keep each other updated on the developments on the ground. This is a vital issue, since when two military superpowers are operating in the same space, the risk of unintended tension is much higher. In other words, based on what we know about the results of the meeting, it's possible to draw the conclusion that Russia and the United States agreed, perhaps by default, not to stand in each other’s way in Syria. They have at least one common enemy there, and the two capitals agree on how dangerous it is. On all other issues their positions are different. This outcome may be modest, but at this point in time it is nothing short of a success.